Gov. 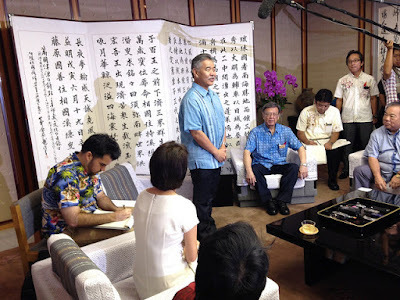 David Ige and first lady Dawn Amano-Ige returned from a diplomatic mission to Asia this week where they visited Okinawa, Japan, and Guangdong, China, to promote economic development, tourism, international student exchanges and the further development of renewable energy. Star-Advertiser. Ending months of uncertainty, Hawaii Gov. David Ige announced Thursday that he has appointed Scott Glenn to serve as director of the state Office of Environmental Quality Control. Glenn will take the reins in November from Jessica Wooley, whose term ended June 30. Civil Beat. Hawaii Gov. Ige is still opposed to NextEra Energy Inc.’s proposed $4.3 billion acquisition of Hawaiian Electric Co., even after seeing more than 50 new commitments the Florida firm made in its updated sale application. Pacific Business News. The University of Hawaii will seek $16.2 million in additional state funding for operations next fiscal year under a supplemental budget request approved unanimously Thursday by the university’s Board of Regents. Star-Advertiser. The University of Hawaii regents agreed Thursday to request $16 million in additional funds for the 2017 fiscal year from the state. Pacific Business News. The University of Hawaii Board of Regents voted Thursday to approve a $700,000 settlement over the removal of former basketball coach Gib Arnold. Hawaii News Now. The $700,000 settlement between the University of Hawaii and fired head basketball coach Gib Arnold is one of several costly contract disputes for the university over the last decade. Hawaii News Now. The U.S. Department of the Interior says a judge shouldn't grant an injunction against an election process that's underway for those with Native Hawaiian ancestry. The department filed what's known as a friend-of-the-court brief in a lawsuit challenging the election. The lawsuit says a race-based election is unconstitutional. Associated Press. The cost of the city’s rail project is now expected to swell to $6.57 billion as rail officials Thursday made public a new outline of the rail financial plan that incorporates additional utility work, traffic signals and finance charges that had not been included in previous cost estimates. Star-Advertiser. For the 50.6 percent of Oahu voters who approved the city's rail project in 2008, the original price tag was estimated at $5.3 billion. Nearly seven years later, the cost of the elevated rail line has ballooned to more than $6.5 billion. KITV4. The only quandary facing Honolulu Authority of Rapid Transportation board members Thursday was figuring out how to pay for future contracts and repay any debt incurred since the City Council has yet to approve an extension of the General Excise Tax. Civil Beat. Construction of new Oahu SPCA shelter hit with violation notices. Hawaii News Now. Rep. Tom Brower has been keeping close tabs on the homeless sweeps in Kakaako. KHON2. U.S. Rep.Tulsi Gabbard injured her nose in a surfing accident Thursday morning at a surf spot area in Waikiki known as “Number Threes.” Star-Advertiser. For those interested in taking a look at sections of the sunken USS Arizona not normally seen — those below the murky waters of Pearl Harbor — the National Park Service is diving on the historic battleship and broadcasting it on a live webcast Saturday. Star-Advertiser. Several amenities have been trimmed from the plans of a long-awaited Waimea district park after the construction bids came in higher than anticipated. The first phase of the project, originally expected to cost about $30 million, has been downsized to $23.87 million, because of “insufficient funds to award the contract at the basic bid amount,” according to a Sept. 14 letter from the Department of Public Works to winning bidder Nan Inc. West Hawaii Today. There will be no permit for the Panaewa Rainforest Zoo and Gardens to import tiger cubs from an Oregon big cat breeder, at least for now. In a meeting Wednesday in Honolulu, the state Department of Agriculture’s Advisory Committee on Plants and Animals decided not to forward the county zoo’s request to bring in two Bengal tiger cubs to the Board of Agriculture for its consideration. Tribune-Herald. An open discussion was held on Wednesday evening at the University of Hawaii concerning Na’i Aupuni, the Office of Hawaiian Affairs-funded nation-building effort. Big Island Video News. State legislators come home to talk story. Maui News. The County of Maui Department of Transportation is seeking public input on proposals to increase Maui Bus Service, as outlined in the draft Maui County Short-Range Transit Plan. Maui Now. In September of 1970, Tom Summers, a surfer from California, arrived on Kauai and landed his first job building a 400-room expansion at the Coco Palms Resort. Garden Island. Jamie Zimmerman, a doctor and reporter with ABC News’ medical unit, has drowned while on vacation in Hawaii. She was 31. Associated Press. Jamie Zimmerman, a doctor and reporter with ABC News' medical unit, has drowned while on vacation in Hawaii. She was 31. Zimmerman apparently lost her footing while trying to cross the Lumahai River on Kauai's north shore and was swept out to sea. Star-Advertiser. County officials have issued another notice about the importance of residents using their refuse carts properly. Garden Island.